What do you know about epidurals and their risk and benefits? In this blog (Part 1) , Dr Buckley explores the impacts of epidural on oxytocin and the flow of labour, and what this might mean for mothers and babies. Epidurals are a very effective method of pain relief for labouring women, and are often encouraged by caregivers, even before labour begins. Like all interventions, epidurals have benefits and risks for mothers and babies. Possible risks include the potential to disrupt the processes of labour for mother and baby. There are also unanswered questions about possible impacts through to motherhood, including effects on breastfeeding and bonding. These FAQs will help you to balance the benefits and risks of epidurals for yourself and your own unique situation, so that you can make the choices that are right for you, your baby and your family. 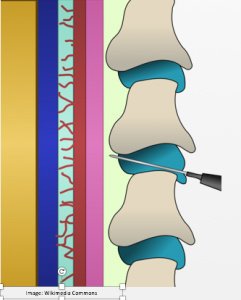 Epidural analgesia involves an injection into the lower back that pierces the outer coverings (”epi-dura”) of the spinal cord. Drugs are injected close to the nerves as they come out from the spinal cord. Usually this involves a “local anaesthetic” (LA) drug such as bupivacaine, along with an “opiate” drug (related to morphine, pethidine/meperidine etc) such as Fentanyl. Epidurals are used in many types of surgery and procedures, and also sometimes administered to relieve pain outside of childbirth. Just like a dental anaesthetic, LA drugs block the sensory nerves, causing numbness, and also inevitably block the motor nerves, giving some degree of paralysis. Opiate drugs are added to an epidural to increase the effectiveness of the LA, so that there will be good pain relief with less motor block. Obviously, the main benefit of an epidural is the very effective pain relief that most women experience. Because of this effective analgesia, epidurals also reduce stress, and stress hormones, in labour. This can be beneficial when women are experiencing very high levels of stress and pain, which can slow labour progress. Are epidurals good if I need a caesarean? What are the side-effects of epidurals? Many of the side-effects of epidurals are due to effects on your birthing hormones. These are the calming, pain relieving, and stress-reducing chemicals that your body naturally produces to make labour as easy, safe and rewarding as possible. (See my Ecstatic Birth ebook for more info). How do hormones help in labour? The hormone oxytocin is particularly important because it causes the uterine contractions that drive labour and birth. 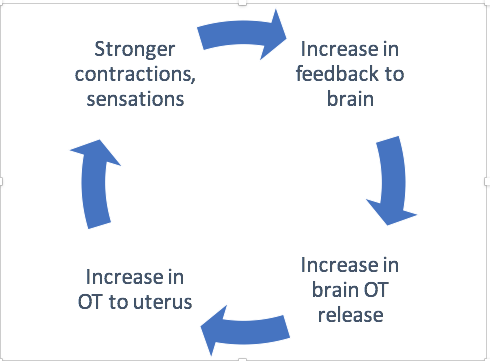 During a natural (physiological) labour and birth, the sensations of uterine contractions are transmitted to the labouring woman’s brain, and drive the oxytocin “positive feedback cycle” (Ferguson reflex). 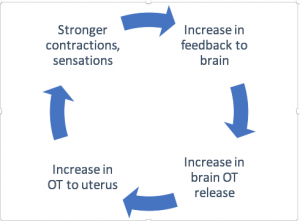 Within this cycle, uterine sensations trigger oxytocin release, more contractions, more sensations, and more oxytocin release. This strengthens labour and also helps the baby to be born quickly and easily. Why do epidurals slow labour? With an epidural, your labour sensations will usually be completely abolished. This means that there is no sensation to drive this oxytocin feedback cycle, and your oxytocin levels will decline. This explains why labour usually slows, and sometimes even stops, in the hours following epidural administration. You will probably require an infusion of synthetic oxytocin (Pitocin, Syntocinon) to compensate for the loss of your own oxytocin, and to strengthen labour again. What are the consequences of missing the oxytocin peaks for mothers, babies, breastfeeding and bonding? How can we fill in the hormone gaps when epidurals are needed? Part 2 Coming soon! Hormonal Physiology of Childbearing Dr Buckley’s in-depth report (2015) has all the scientific detail and studies. See particularly sections 3.2.5, 4.2.5, 5.2.6 and 6.2.5 .